Lizzie Chesson and groom Joanna Szwajkosz. Gladstone, NJ - The USET Foundation was proud to award this year's Moore Trophy to driver Alan Aulson of Bronson, FL. This was the first time that Aulson has won the trophy. 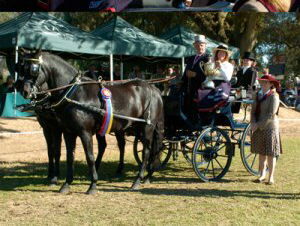 Alan Aulson and his team of Morgans, Nordby Coalie Duke and Meddo's Chief George, won the 2006 USEF National Horse Pairs Championship on October 6-8, 2006, at the Shady Oaks CDE in Lodi, California. Another career highlight for Aulson was his participation as a member of Team USA at the 2005 FEI World Pairs Driving Championships held in Salzburg, Austria. He is a Massachusetts native and owns the Black Prong Equestrian Center in Bronson, Florida. For winning the USEF National Horse Pairs Championship, Aulson was given the Moore Trophy. The Moore Trophy was donated to the USET in 1982 by Pauline Nickerson in memory of her parents, Mr. and Mrs. Paul Moore. The Moores were great advocates of the driving discipline and were involved with the Myopia Driving Club. They were the owners of Hollow Hill Farm and Seaton Hackney Stables in Morristown, NJ. They were famous for breeding, training, and showing quality hackney horses, the most famous being Seaton Pippin, who won at the National Horse Show in Madison Square Garden, at the Devon Horse Show, and at Newport, Rhode Island. The Moore Trophy is actually a trophy retired by Seaton Pippin during her career. 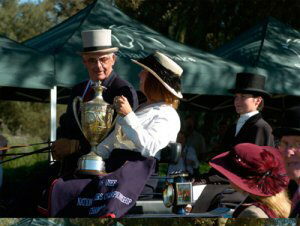 Nickerson felt that donating one of Pippin's trophies to the USET as a perpetual driving award would be an appropriate memorial to her parents, since the time spent on the show circuit meant so much to them. In the 24 year history of the Moore Trophy, over half of the winners have won with Morgan horses, so it was a fitting victory this year for Aulson. Aulson was thrilled not only with his win in the competition, but to receive the trophy. "It was a special occasion to win the Moore Trophy. It's by far the most prestigious award that I've gotten, and it came with the title of national champion, which can't be taken away," he related. "There are tremendous names on it, and it's extremely impressive. What was most exciting to me to notice was that about 50% of them drove Morgans, which emanated a few times over for me. Those are the people I look up to as top drivers, and to be at least on the same plaque with them feels good. That trophy can't be replicated, so I'm really proud to have it for at least one year. We'll see what happens next year!" The United States Equestrian Team Foundation supports the competition, training, coaching, travel and educational needs of America's elite and developing international high performance horses and athletes in partnership with the U.S. Equestrian Federation. For more information on the USET Foundation, please visit www.uset.org. awarded by the USET Foundation.